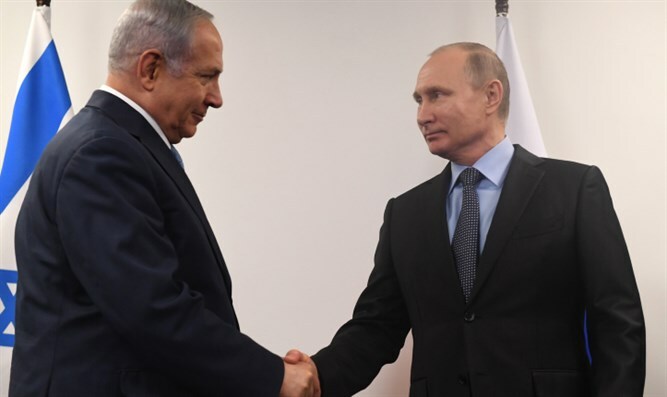 Prime Minister Binyamin Netanyahu told Russian President Vladimir Putin on Monday that Israel will not tolerate Iran’s military buildup in Lebanon, or Iranian efforts to establish a foothold in Syria. Netanyahu met with Putin in Moscow Monday, touring the Jewish Museum and Tolerance Center in the Russian capital before a closed-door meeting focusing on the Syrian civil war and Iranian hegemony in the Middle East. The meeting took place a day after a senior IDF spokesman said Lebanon was being turned into “one big missile factory” in service of the Tehran regime. "It is no longer transfer of arms, money, or advice," said Brigadier General Ronen Manelis. "De facto, Iran has opened a new branch, 'Lebanon branch - Iran is here.' The IDF is prepared and ready for all scenarios, and plans to further improve its capabilities and readiness throughout the year. As we have proven in recent years, and those who need to know about it know, our security red lines are clear, and we prove this every week. The choice is yours, the citizens of Lebanon." Netanyahu echoed Manelis’ accusation Monday morning before he flew to Moscow, vowing to discuss with Putin “Iran’s effort to turn Lebanon into one giant missile site” for attacks on Israel. In Moscow, Netanyahu said that Israel is "still ready to prevent any attempts of this type of ideology, in the first place Iran, which speaks of the intention to destroy us". "We will stand before them [Iran] with all our might," Netanyahu said. "There will not be another Holocaust." After the meeting, Netanyahu spoke with journalists, calling the meeting with the Russian leader ‘constructive’. Netanyahu pointed out that the missile factories in Lebanon were still in the early stages of construction, but emphasized that Iranian forces operating in the area must understand that not only Israel but also the US would not tolerate the manufacture of such weapons on Israel’s northern border. The Prime Minister then turned to the Iran nuclear deal, and efforts by Israel and the US to alter the agreement.